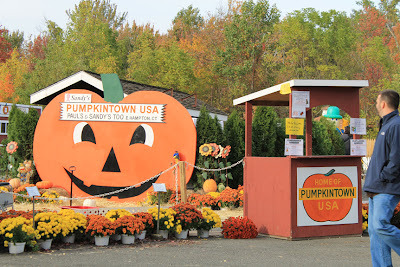 In October I flew to Connecticut to finally meet my buddy Christina! 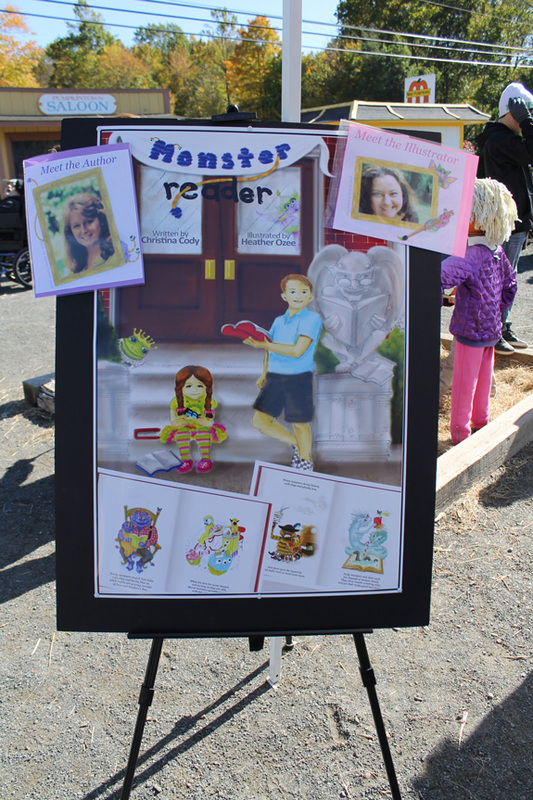 Christina is the genius children's book writer who authored Monster Reader. She was a fabulous host and her family was the sweetest! So what was this trip way up north centered around? A book signing! 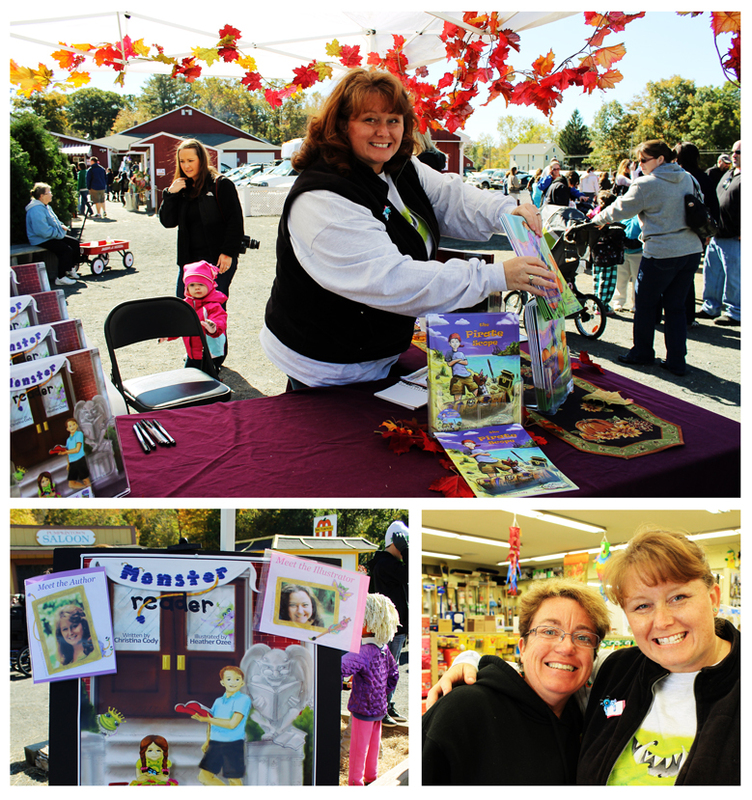 We were honored to do our book signing at Pumpkintown USA, a very special place with a very special cause. 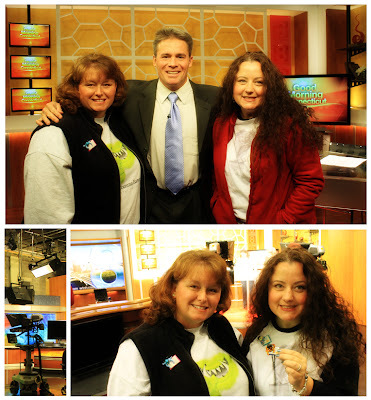 We also squeezed in an appearance on Good Morning Connecticut. It was strangely comfortable being interviewed which I never would have guessed before hand. We sprinkled in loads of amazing food between all the work and fun... along with a load of Dunkin Donuts Mint Hot Chocolates. I couldn't be in Mystic Connecticut without hitting Mystic Pizza! Hello, I've watched that movie a million times. 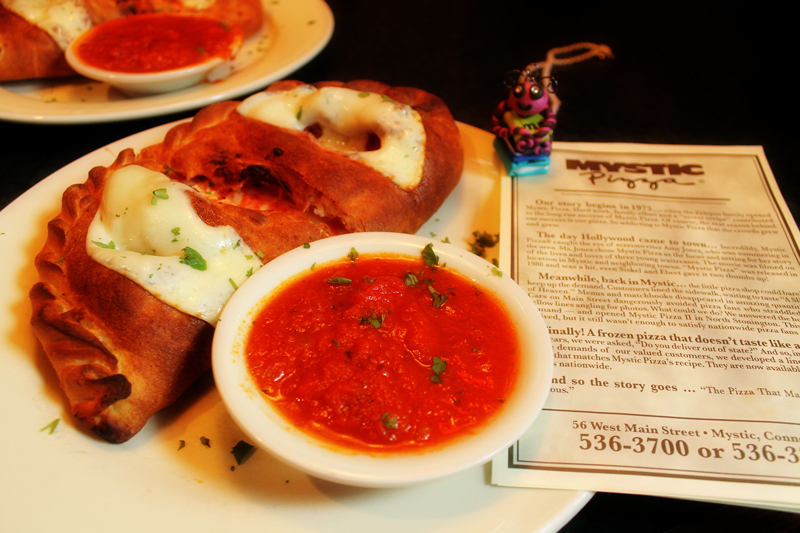 We grabbed calzones and I even got brave and had fried pickles! It was great. The restaurant plays the movie 24/7 and I had to giggle when the hitch hiking scene came up. After we were filled to the brim we stopped in at the cutest little shop, Why Ever Not. 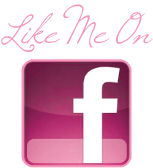 A fun boutique full of all kinds of fun items great for gifts or just to jazz up your house. I loved the cards the owner of the store illustrated. She's also the hand behind the gorgeous whale that stands guard in front of Bank Square Books, the book store in Mystic that carries our book! After the interview we stopped off for an amazing meal at Somewhere in Time and then we were on our way to the signing. 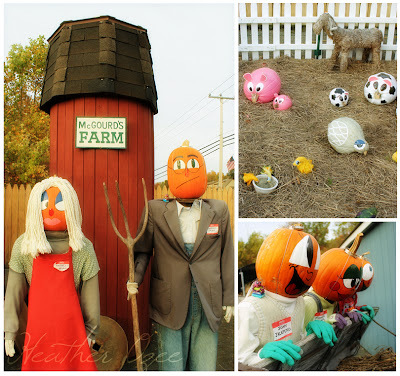 Pumpkintown USA is a fun family destination filled with Characters made of pumpkins, tired to jump on and loads of stuff to explore. But this fun town isn't just about having a good time, it's about honoring a dearly loved lady by raising money for breast cancer causes. Sandy Peszynski passed away after a 25 year battle with Breast Cancer. 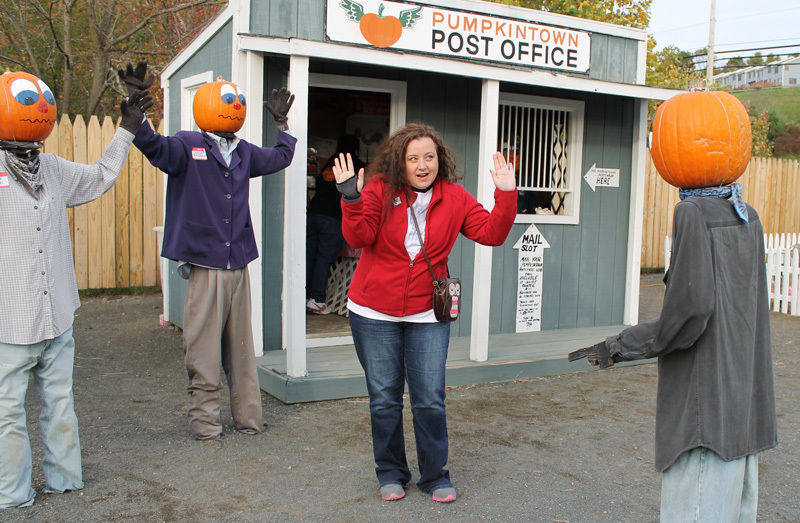 Sandy was the brain child behind Pumpkintiwn and many of the characters. Christina showed off her expert marketing skills! 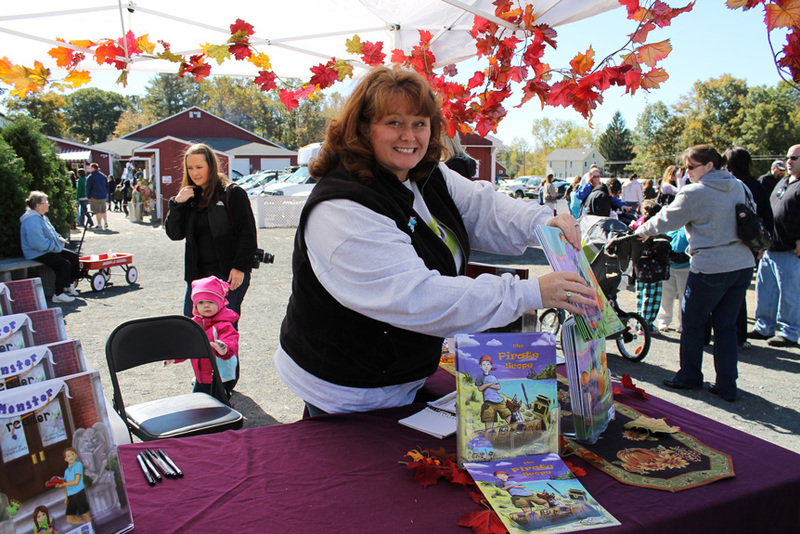 There were lots of special people who made Pumpkintown possible. And they all do it with a smile. Read more about Pumpkintown and how you can get involved in the fight against Breast Cancer go to their site here. My long absence has finally come to a close. I've finished illustrating Monster Reader, Enjoyed a wonderful weekend trip to Connecticut for a book signing, interview, and just some fun girl time with Christina. 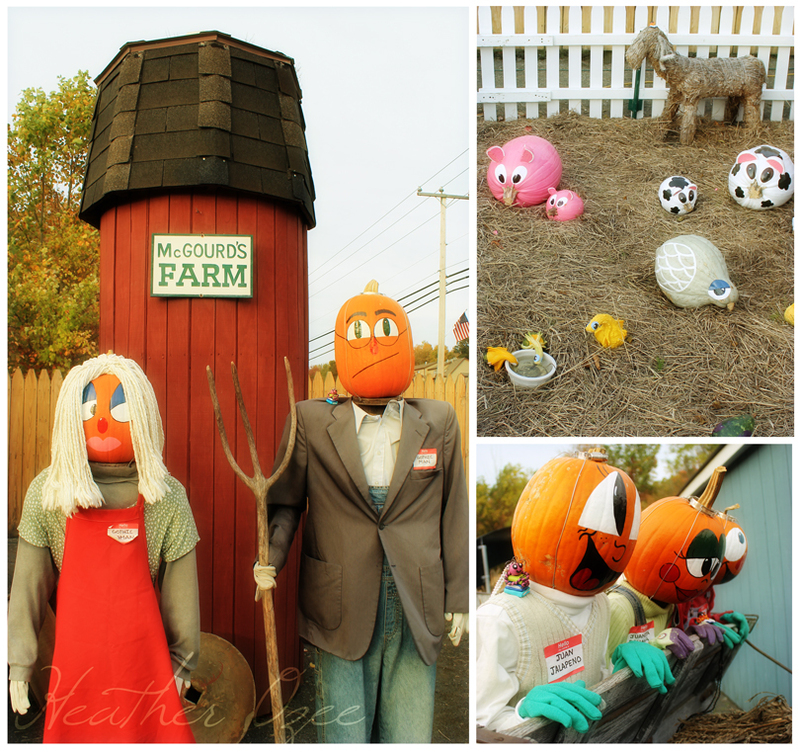 Connecticut was filled with wonderful people, tastes and beautiful things to see. I'll be posting a special trip report in the coming days. But let me tell you I can't wait until my next trip to see my buddy Christina and her wonderful family. Our family took a fun last minute weekend trip to Cave Springs that was absolutely amazing. A charming town filled with lovely old homes and shops and best of all a spring that feeds the town with fresh water. This little town has to have a post of it's own to fit in the people we met and photos of the town we fell in love with. Sadly we also said good bye to the patriarch of our family. my grandfather Silas Sumner went home to be with the Lord on September 12. He is missed every day and was loved from the toes to the tip of his very big nose! The changes that come with losing the head of a family are never easy and are very much like salt in a wound, but we all must go on and that is what we shall do. Now of course anyone who knows me at all knows that this girl has her Christmas tree up the day after Halloween! And this year is no different in that respect. And the fall leaves and crisp mornings combined with the twinkle of Christmas lights have conjured a storm of creativity. Cinnamon Ornaments, Paintings, and Snow Globes! For today let's talk Snow Globes. I've always loved them, and now thanks to several magazines I've browsed lately I making my own. 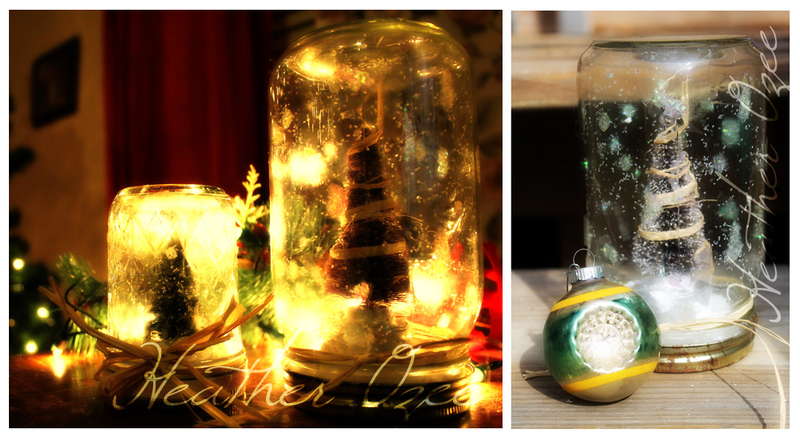 These are more like snow globe meets terrarium. This DIY Snow Globe Project is perfect for a lazy Saturday morning in your jammies with the kids. 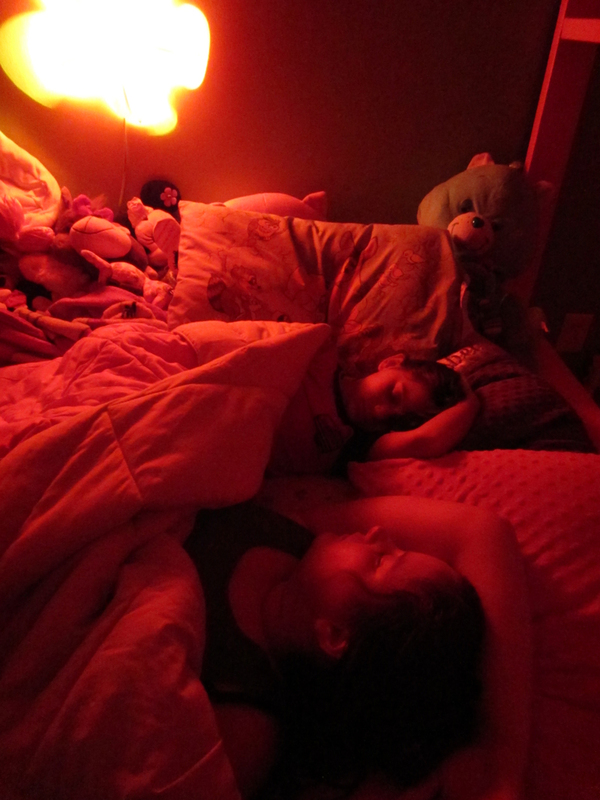 My kids made their own with minimal mom help. Hot glue the object onto the lid of your clean jar. In my case I added an empty votive tin to give my little tree height. 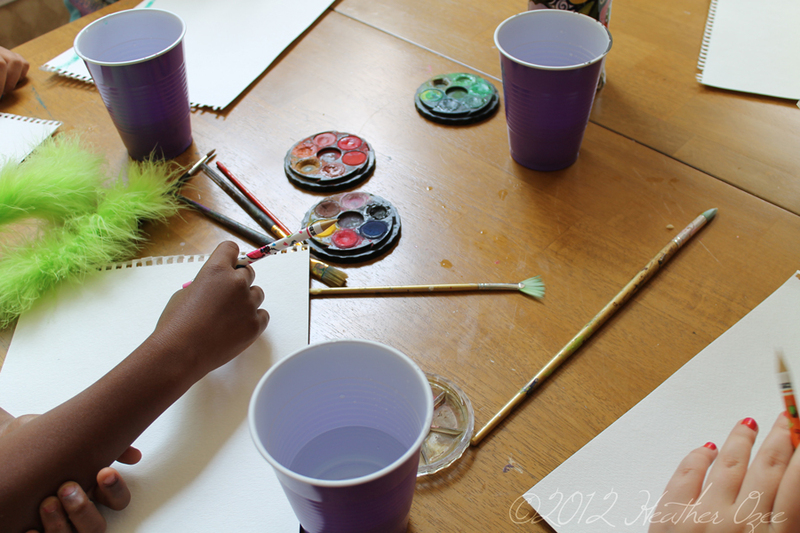 Spread Elmer's glue around the object on the surface of the lid and cover with snow flecks and glitter. Dab glue here and there along the inside of the jar and then sprinkle glitter inside and roll the jar to coat the inside surface with a fine dusting of glitter. finely place the jar over the lid screwing it securely and wrap the base with raffia or ribbon. That's it and it makes a lovely little gift. Customize it with a little police figurine or Eiffel tower.. the sky's the limit with this fun craft! There are lots of people I love. Heather Baird is one of those people. My sweet cousin.. painter, baker, photographer and pug lover is one of those people that lights up a room with happy giggly goodness. 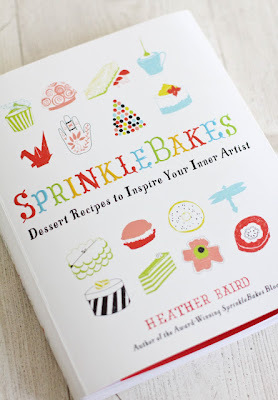 Heather has a fabulous new cookbook out called Sprinkle Bakes and an award winning blog. 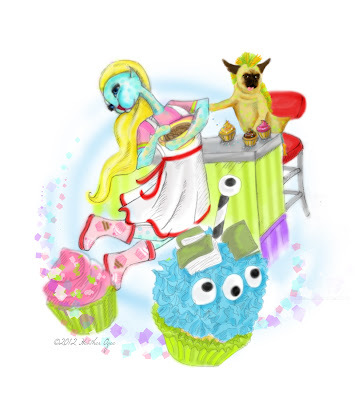 And even though she is up to her arm pits in alligators, she still was sweet enough to come up with a Monsterous Cupcake recipe for our new Monster Reader Children's Book. So, what would Heather look like as a monster? Well, here's a little lucky lou at my sweet cousin and Biscuit the wonder dog as their alter Monster Egos. Be sure to grab Heather's book and drop by our Kickstarter Campaign to donate, or just to share it on Facebook. We can use all the support we can get! I've been working on a very special project since February. 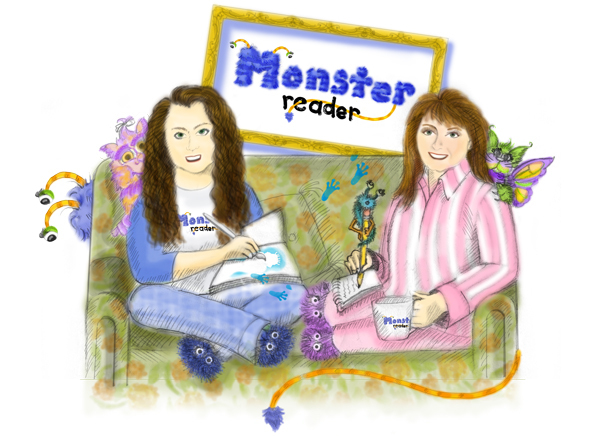 Monster Reader, the book I teamed up with Christina Cody to illustrate is a tale of Monsters, a library, family and all things Books! This wonderful journey is starting to wrap up and we are now excited to share the kickstarter campaign with all of you. When you visit the project home you will find the book trailer, a project donation guide to explain what goodies you get at each donation level, and you can get to know the author, or as I know her.. my dear friend. 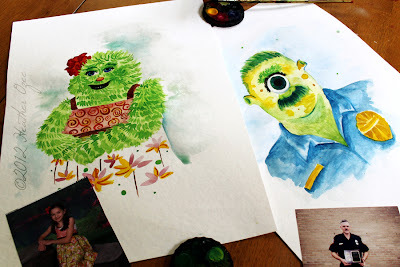 Custom Monster Portraits are an example of one of the treats you get by donating at the Legend Level. The donor would email a photo of the person they want "Monsterized". In time the donor will receive a custom watercolor creation of their subject's monster alter ego. We of course could use all the support we can get, so please feel free to share some link love, donate if you can, and most of all enjoy the magic that is Monster Reader! Miss Isabel has had a nice Birthday weekend. She saw Brave, had a couple of friends spend the night, and was surprised by a neighbor with a lovely pool party complete with balloons! 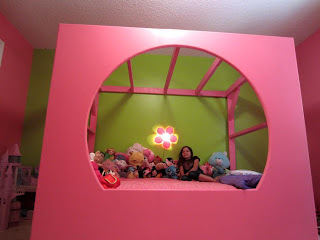 Oh.. and she had her room redecorated! 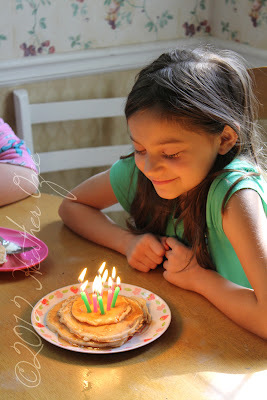 This morning we had pancakes and paints! 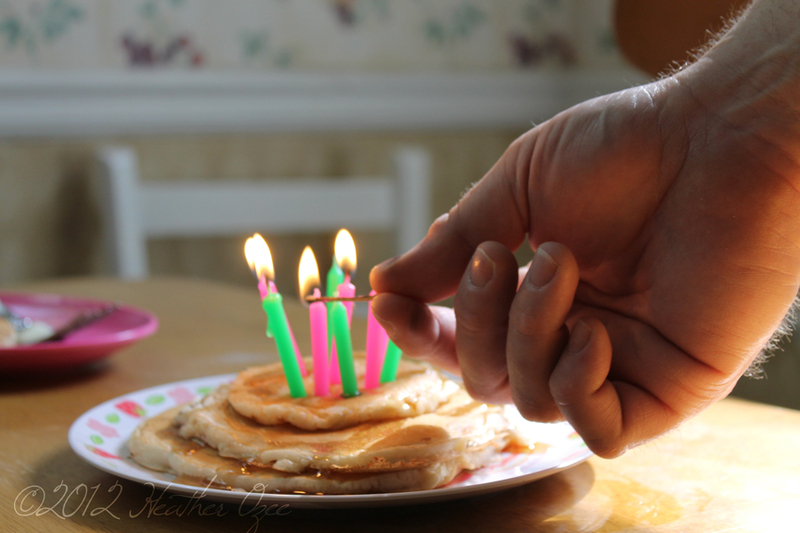 Isabel's pancakes were topped with candles lit by daddy. Then after we cleared breakfast we all settled in for some relaxing watercolor painting. This year Miss Isabel had a Room Makeover instead of a Party... gasp.. No water slide! We'll live, especially since our sweet neighbor invited the girls over for a late night swim on Isabel's birthday. Love Ya Debbie! So the plan was to de-cluter, which involved borrowing a pick up truck loading it to the gills with toys and out grown clothing to take to the women's shelter in out town. She picked paint and comforter and we were off.... accept she fell in love with a bed. 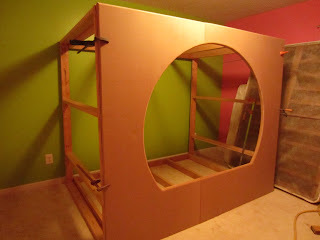 The bed looked cute, a find on pinterest with the little one in my lap, and I thought... that's a project for Papaw Alligator! Papaw Alligator got his name from fishing in the river near his home and waking alligators on the head with his paddle when got too close to his little john boat. I come from a long line of stubborn "I was here first people", and he's a great example of that. So Papaw Alligator, my Dad has a gift with wood just as my mother does. We showed him a picture and he was off drawing plans and buying supplies. He cut the wood in my driveway with my step mother and I at his side dodging saw dust and the nail gun. 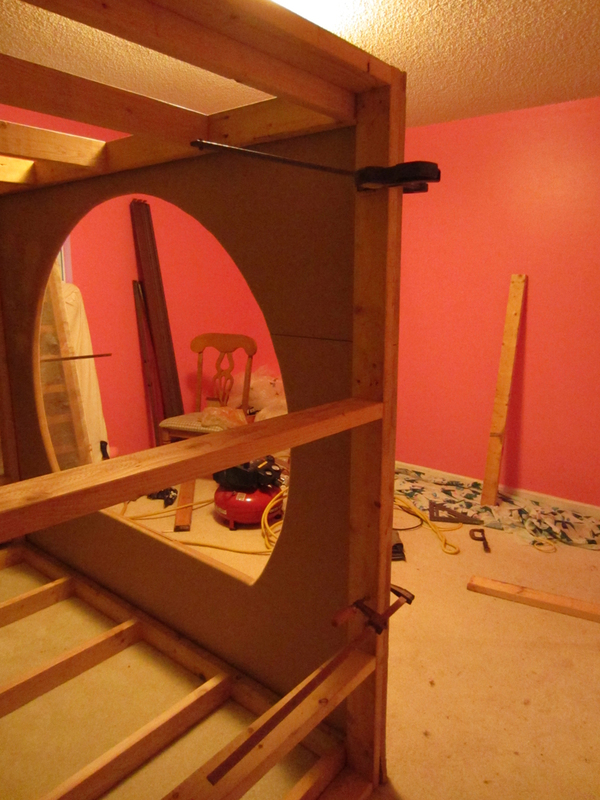 When it was done and the dust settled we carried the walls into her rook and I dodged the nail gun a little more. By late evening my mother was over and she and I were painting away. Can I say hot pink paint shows up even in this curly hair! I sit at my desk as we speak with a nice hot pink spot here and there in my nest of curly locks. So all that is left is to put up the curtains on each end and at the entrance as well as top it with a canopy like fabric. That will be done by Friday! 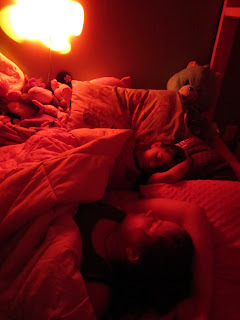 Seeing Isabellies face when she saw the bed was great, but even better was kissing her bye this morning on my way to work and seeing her and her big sis tucked in all snuggled up. Special thanks to Papaw Alligator, Lyn and Grandma Paula. Y'all made this a very special birthday for my Isabel... and gave her mom a sweet spot to read bed time stories with her.